The plasticware cabinet has been tamed! Anything that went back into the cabinet had to have a matching lid. Containers with any sort of damage would be chucked. Anything we hadn’t touched in a year would be thrown out or relegated to basement storage. A very fun but never-used, ice-cube tray for making arrow-shaped ice. Two metal racks for our pizza stones. We use the stones once a week, but never use the racks. A scraper for the George Foreman grill that we gave away prior to moving to Albany in 2009. A travel coffee mug that I didn’t know existed. A stack of lids for plastic deli containers. A lasagna pan that we use from time to time, but not frequently enough to store here. Several containers either damaged or missing lids. Several lids without matching containers. A cat-shaped lid for cans of cat food. Our cat has had canned food a total of three times. One of those trays for microwaving bacon. Gag. I have no idea why we own that thing. Storage space is at a premium in our kitchen, so weeding out all this stuff made a big difference. It’s not easy to see, but you get the overall idea. It’s an organized cabinet! 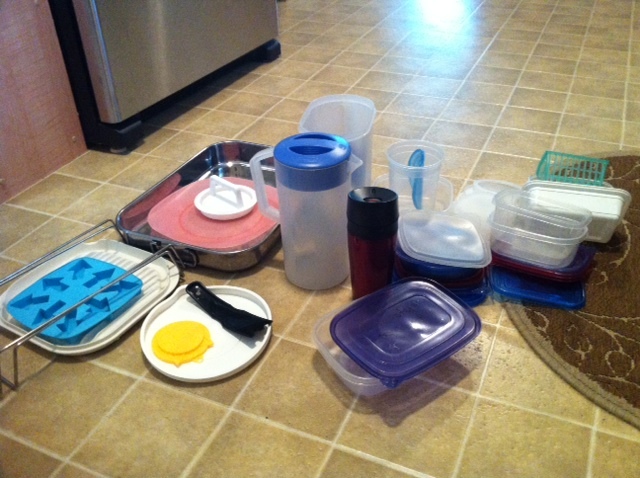 The remaining lids and containers are organized by size/shape. 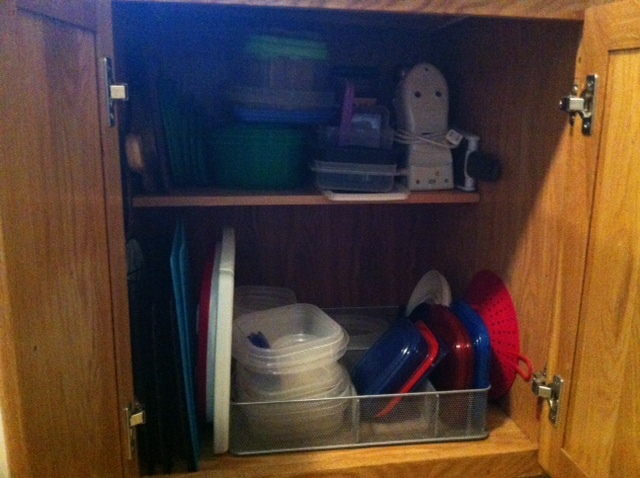 Larger containers and the electric mixer live on the top shelf, cutting boards and containers on the bottom. After taking this photo I relocated our travel mugs from the counter to the area behind the container storage, and placed the toddler snack cups in the open area in front. There is also room remaining for our glass/aluminum food storage containers that currently take up valuable counter space. Nice job! I did this while I was pregnant. Feels good to get rid of crap!